Loose curl weave is made of high quality Brazilian virgin hair, which has been processed to be loose wave texture. 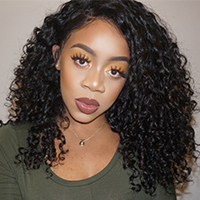 New Star Hair provides black women and girls with fashionable hair bundles and wigs, which will give you gorgeous look especially you are going for a night out club party. Our loose curly hair weave uses the virgin hair as raw material, so women who like them could dye the wig to change any color as desire.